WW2 Defences - Suffolk: Hollesley Pillboxes and some NEW tank blocks!! Hollesley Pillboxes and some NEW tank blocks!! I've walked the seawall from Shingle Street north towards Boyton on numerous occasions and thought I'd seen all the Second War Defence remains in this area. However last week, while down this way on work, I noted a concrete base in a field at Hollesley Marshes and thought at first it was probably a base for a Nissan Hut or something similar. However a closer look revealed it was hexagonal in shape, and just behind it was the remains of a pillbox! Must admit at first I thought I'd found another unrecorded pillbox, but it is on the local HER although its significance, in my opinion at least, has been missed. The Defence Of Britain Data Base list's it as Type 22. However it is clearly the same design as the shell proof infantry pillbox designed for the Eastern Command Line - a CRE1113, with 3'6" thick walls. It is a moot point whether this is a unique design or just an 'expanded' Type 22 - however given the documentary evidence of this type of pillbox being designed specifically for the Command Line I consider it to be a distinct design. 1. It is the first example of a CRE1113 in Suffolk I've seen away from the Command Line. 2. It is the first example I've seen of a shell proof infantry pillbox as part of Suffolk's Coastal defences (the only other shell proof design I'm aware of as part of the Coastal defences is the pillbox designed to house two Vickers machine guns - e.g. the two that can be found at Blythborough). All the other pillboxes I've seen to date as part of Suffolk's Coastal Defences are bullet proof Type 22's, 24's or 'Suffolk Squares'. 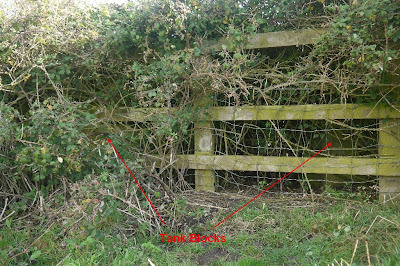 The disappointment of not finding an unrecorded pillbox did not last long however, as nearby I found two anti-tank blocks, part of a road block or perhaps a once extensive line of blocks running across the marshes in this area, that certainly have not been recorded before!! This puts the defences in this area into context; this area is perhaps the second best 'Strong Point' remaining in Suffolk that I'm aware of (the best being the pillbox / trench network at North Warren). Above: Spot the tank blocks!! They are approx 4' cube. These defences were clearly sited at Orford Haven on the mouth of the River Ore to guard an exit inland. The potential of the Germans landing on Orfordness and bridging the River Ore was fully considered and these defences guarded one of the few routes inland if the Germans tried to carry this out. 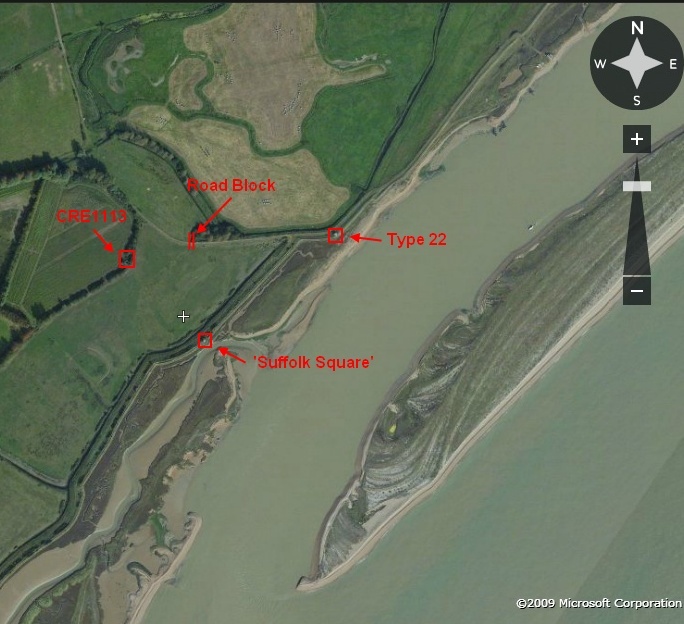 The target of any landing in this area would have been Orford Quay, these defences also guarded the mouth of the River Ore and the approach to Orford Quay. In 1940 the defence of this area was in the hands of the 2nd Liverpool Scottish. Nothing much is stated in the War Diary about this area although Exercise Force Donnerwetter does give some indication of the anticipated threat. 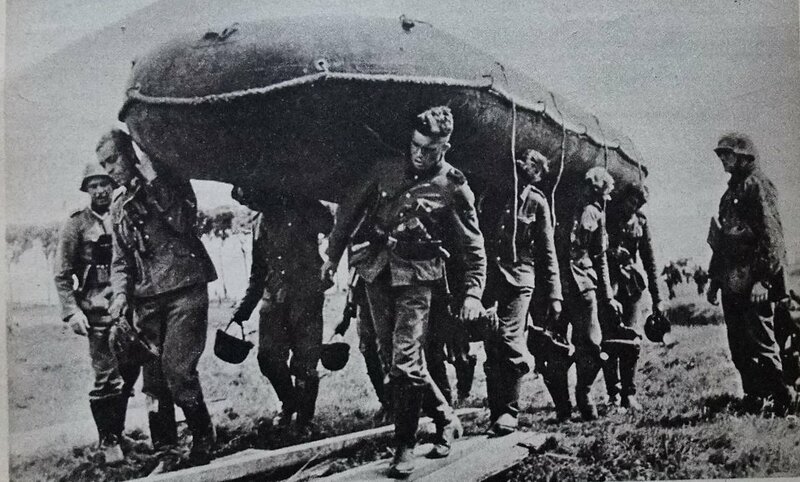 This exercise's narrative assumed a landing on Orfordness at 0600 hrs on 10 Sept 1940, and the crossing of the Ore by rubber boats to seize Orford Quay. Barges with Armoured Fighting Vehicles were then brought up the river and landed at Orford Quay. The threat to this area does not seem to have been taken so seriously in 1941 - the pillboxes just to the north had their embrasures bricked up (15th Scottish Division Beach Operating Instruction No 10- see previous blog post on this) although the pillboxes to the south were still clearly included in the defence scheme as they were not bricked up and Turnbull mounts for light machine guns were added to some. 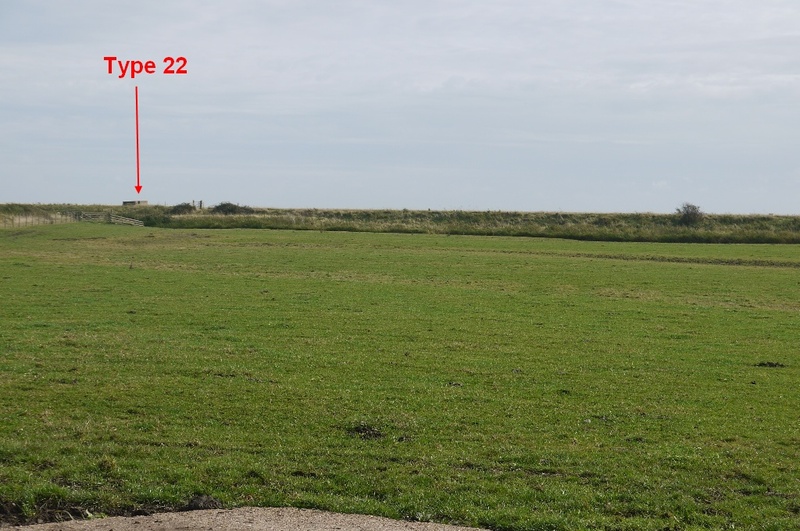 The fact that the only shell proof infantry pillbox I'm aware of on the Suffolk Coast is located here, in my opinion, shows just how seriously the threat to this locality was taken. The role of this pillbox would have been to cover the forward pillboxes sited on the seawall - i.e. defence in depth - along with the road block / anti-tank blocks. 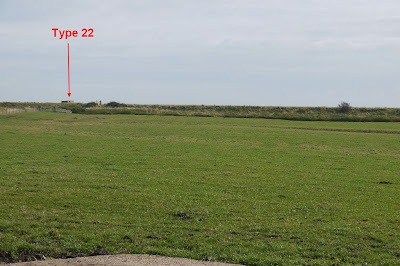 Bottom - Field of fire from the CRE1113 pillbox - note how it covers the rear of the pillbox sited on the seawall. 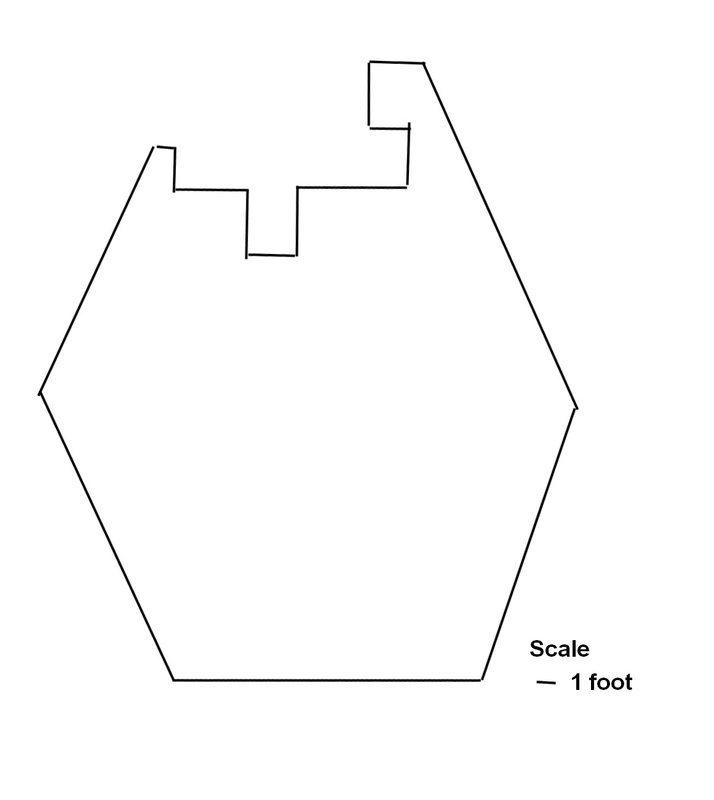 So what was the concrete hexagonal base for? 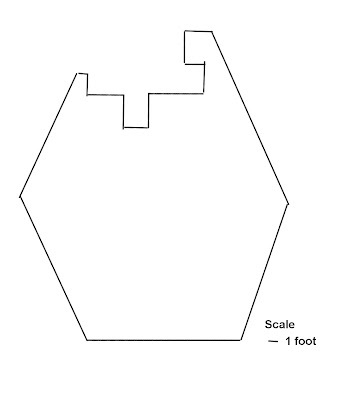 The Suffolk HER suggests a possible platform to mount a gun but there is no holdfast or any indication remaining to suggest a gun was mounted. Possibly a more likely explanation is that it is a raft for a pillbox - perhaps the Engineers changed their mind on the location of the pillbox at the last minute or perhaps contractors appointed to construct the pillbox tried to take the easy option of sticking it in the field as opposed to the hedgerow (assuming of course the hedgerow existed in 1940!!). However I must admit it does not look like any other raft for a pillbox I've seen before! Above - Top: The concrete platform and pillbox just behind it. So why has this pillbox been partially demolished? 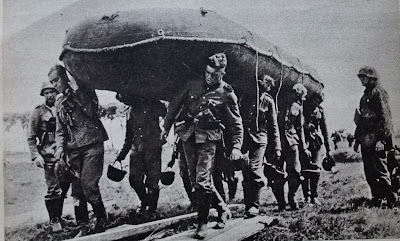 It is almost certain it was used by Assault Engineers for training in preparation for D Day. The reason why this pillbox was chosen and not the others in the area is probably due to the fact that it was shell proof - surely the Engineers would have wanted the challenge to 'attack' the strongest pillbox possible. The damage is substantial - the roof has been totally demolished, five out of the six embrasures are damaged and the low level blast porch entrance has been severely damaged. The damage does however reveal some useful information on how it was constructed. Reinforcing consists of 3/4" rods, 1/4" inch rods and a 6"x6" mesh of 1/6" thickness. The exterior shuttering consists of 3" thick concrete blocks while the interior shuttering was of wood. The pillbox was constructed in three 'lifts' - the first 'lift' to embrasure level, the second 'lift' incorporating the embrasures and the third 'lift' to the roof. Finally credit must be given to HM Hollesley Prison for organising the cleaning up of the Type 22 on the seawall - they have done a fantastic job as the photos below show.